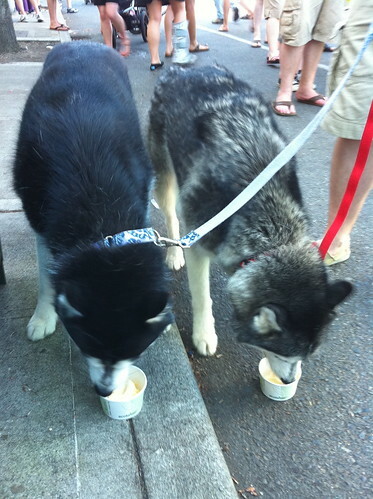 Yesterday we went on a family outing to a place called Husky Ice Cream. 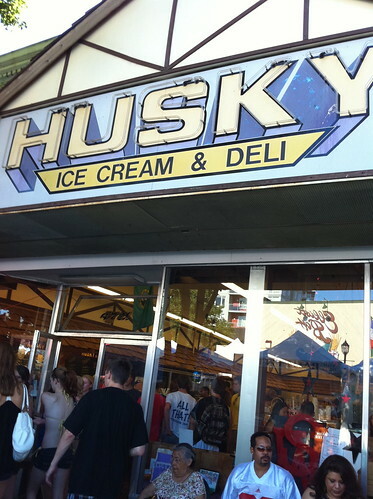 They make all their ice cream in the store and with a name like "Husky" you know it's going to be the best. What we didn't know until we got there was that the neighborhood was having a street fair, so the place (the ice cream shop and the streets) were packed! That doesn't bother Kat or me though because we like being admired by all the people. What it does mean is that Mom didn't get very good pictures because there were so many people around. When we first got there, Dad left us with Mom and went inside to decide what flavor he wanted. He picked Oreo. While he was inside, Kat and I were very good and sat next to Mom. She could hardly believe how good we were but mentioned that the summer heat has it's advantages, whatever that means. After Dad picked his flavor, he came back outside and gave his order to Mom and then stayed outside with us while Mom went to get the ice cream. At this point, I was getting kind of worried, because Mom didn't ask me for my order. I shouldn't have doubted Mom though because she came back out of the store with two bowls of vanilla ice cream for Kat and me, Dad's Oreo ice cream cone, and a chocolate chip cookie dough ice cream cone for her. We never knew she could balance so much ice cream! 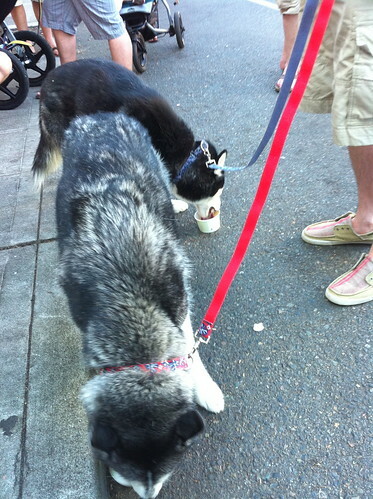 Right away, Kat and I got to work eating our ice cream so it wouldn't melt. I think Kat started to worry that I was going to try to take hers because she picked it up and moved. About this time, Mom's ice cream cone was dripping on her hands, so she stopped taking pictures. We really loved our ice cream. It's the first ice cream we've had that wasn't soft serve and it was delicious and took us a lot longer to eat, which Mom and Dad both appreciated. So I say, if you're in the area, go get yourself some!